To lock your file so that other users can’t open it, see Protect an Excel file. To prevent users from adding, modifying, moving, copying, or hiding/unhiding sheets within a workbook, see Protect a workbook. To know the difference between protecting your Excel file, workbook, or a worksheet see Protection and security in Excel. Formulas: If you don’t want other users to see your formulas, you can hide them from being seen in cells or the Formula bar. For more information, see Display or hide formulas. Ranges: You can enable users to work in specific ranges within a protected sheet. For more information, see Lock or unlock specific areas of a protected worksheet. Note: ActiveX controls, form controls, shapes, charts, SmartArt, Sparklines, Slicers, Timelines, to name a few, are already locked when you add them to a spreadsheet. But the lock will work only when you enable sheet protection. 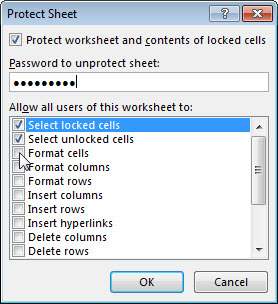 See the subsequent section for more information on how to enable sheet protection. Select the cells that others can edit. Tip: You can select multiple, non-contiguous cells by pressing Ctrl+Left-Click. Use strong passwords that combine uppercase and lowercase letters, numbers, and symbols. Weak passwords don't mix these elements. Passwords should be 8 or more characters in length. A passphrase that uses 14 or more characters is better.